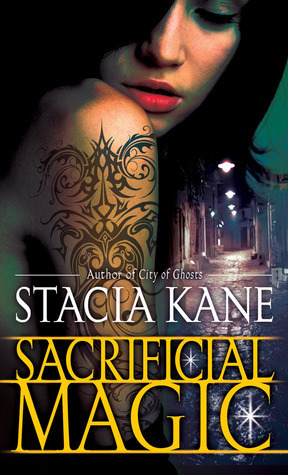 Sacrificial Magic (SM), the 4th book in Stacia Kane’s Downside Ghosts Series and it’s her best book to date. Cepts, Nips and Panda’s, OH MY. These are all Chess’s drugs of choice, plus the occasional trip the pipe room. Yes, the series about a drug addicted heroine named Chess Putnman that’s a witch investigator that debunks ghost haunting for the Church. But don’t let the drug addiction turn you off. Chess has had a very hard and abusive childhood being passed around different foster homes where the dads and sometime moms have used her as their form of entertainment. Chess at heart is a survivor with very low self-esteems issues. She uses her pills as a way to escape her feelings and pain of the past. Even though Chess has finally found love, she still believes that she is unworthy of that love and does everything in her power to mess it up. There is one scene (well more than one) in Sacrificial Magic where I just want to slap the hell out of Chess for being self deconstructive when it comes to her relationship with Terrible. Yes the two still does not have it easy and even though I do get frustrated I like the fact that Kane doesn’t turn Chess and Terrible into the old married couple after they FINALLY get together. They both live hard lives and even though they have found love with each other, they have to work at their relationship. And speaking of being frustrated; SM is a big freaking sexual tease through half of the book! There a few scenes where you thought you were going to get to see Terrible and Chess go at just to have something stop their fun. Chess finds herself smiling a lot in SM and wondering what that is all about. Could this be what normal people do? Oh and we learn a little something personal about Terrible; he likes his dames o-natural. So no more waxing for Chess. When I read that line in the book I had a huge smile on my face. There was little more humor in SM and it was nice to see. Chess gets a case from the Church that has been dropped by another debunker at a school on the other side of town where she has to cross the drug dealer’s line finding herself in her ex’s territory. This doesn’t help things with her and Terrible’s relationship. But she has no choice but to work the case. She uses her ties to Lex (her ex) to help figure out what’s going on at the school with the haunting. Fans of dark and gritty UF with damaged heroine and unusual heroes will fall in love with this series. I said this sounds great! I'm so excited!!! Tuesday can not be here fast enough. And wow, favorite book of the year? so that means that it's better than the last 3.. I can't even imagine it. Thanks, great job with the review. Like Heather, this is on my best of the year list. Loved, loved, loved this book.